BTV: RD21 | Z. Merrett interview - August 14, 2016 We caught up with the stand-in captain. Merrett led the Bombers to victory against the Suns. Essendon’s stand-in Captain Zach Merrett has revealed a mid-week phone call to Geelong’s Joel Selwood helped him prepare for his leadership role against Gold Coast. With Brendon Goddard out injured and Mark Baguley already ruled out for the season, the Bombers turned to their third youngest stand-in skipper in the Club’s 140 year history. Merrett has sought counsel from Chris Judd throughout the season and turned to Selwood in the days leading up to the game against the Suns. “I was lucky enough to get Joel Selwood’s number during the week and gave him a call,” Merrett said. “I had a good chat to him and he had some choice words and it was fantastic. “(Selwood said) just to be myself and keep doing what I’m doing. Merrett collected 38 possessions and was a constant driving force through the midfield, alongside David Zaharakis who gathered 40 disposals. 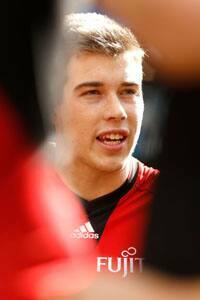 “We as a leadership group (Joe Daniher and David Zaharakis) – we were set for a big game,” Merrett said. The Bombers kicked four goals to one in the last term to record their second win of the season. “Woosha was fantastic at three quarter time inspiring us to play on and play on instinct,” Merrett said. “I thought Tipungwuti and Gleeson and McKenna off half back just kept taking the game on for us. “It just shows how much it means to the playing group and the staff and the fans that came along today, it’s just fantastic.